Almost hidden behind stately and well placed trees on busy 31F, this impressive Colonial Revival style home, built in 1926, is worth a second or third look. The photograph shown here is a very recent one and does not reflect the grandeur as a family home built and owned by the Woodward family. We have been fortunate to discern the name of the architect which is that of James Tyler of Rochester who drew the plan in 1923. We obtained that information from John Woodward who was the second son of George and Virginia Woodward who had purchased the land from a wealthy landowner named Harris. It was called Harwood Farms – a combination of the two names. The first floor of the home is brick – even the sills of the windows are of that material. The second floor is stucco. The roof is not to be overlooked. It is covered with large, multi-colored slate and the gutters are copper. The center entrance is dominated by a Federal style doorway with an elliptical fan light. Above this doorway is a three-sided bay centered above the main entrance. The room in which this bay opens was probably a small bedroom with a window seat from which one could see all of sophisticated guests arriving for one of Mrs. Woodward’s numerous and elegant dinner parties. She was a member of Rochester’s elite society and entertained lavishly and often. The fireplace has a high wooden mantel with three panels above the opening, which is bordered with three inch tiles in a variety of shades. The hearth is the same. This fireplace is backed by another opening on what was an enclosed sun porch. It is faced with brick and the shelf mantle is supported by wooden brackets. There is a third fireplace in the basement gentleman’s room. The master bedroom on the second floor is reached by a wide stairway with colonial type bannister .It is lit by a large double casement window from which is a wonderful view of the rear yard and the wooded park behind it. This is a good sized master with closets and three good sized windows and has an additional room attached on the north side. This may have been originally planned as a nursery, but in John’s notes, it was his mother’s sewing room. Johns says there was a large tree outside of that sewing room window- just right for climbing and peering in at his older brother, George, was recovering from an accident involving being hit by a car in front of the house. John, who had been kept from bothering his brother, was glimpsed by Mother who vociferously demanded John’s descent! Some of John’s other self described mischief occurred one evening before an elaborate dinner. When his mother came to tuck him in bed, she found, as he relates, that he had made of meal of lipstick, rouge, face-powder and was ready for the mascara. The next time there was an incident of painting his large, wooden fire truck black and had more paint on him and his hands than on the truck. He says the bath that time was of turpentine! George Woodward was manager of the Likely’s luggage store and at the time of the Great Depression in 1929, he was a full partner. The stock market crash took a heavy toll on the store and the lovely home of Harwood farms had to be sold. 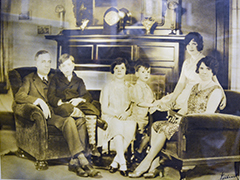 The next owner was Rodney Janes who purchased the home in 1933. He owned his own business and was well known in the community and was elected a NY state senator from years 1939 to 1946. He had amassed a considerable fortune by the time he died in 1973, much of it in Eastman Kodak stock. Janes deeded his home to the Town of Pittsford to be used as a library within 5 years. A children’s library had been established in the home by 1975 and it served as such until 2005. 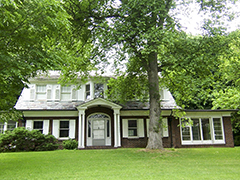 With the opening of the new library within the village, the Janes branch was no longer needed and was deemed not suitable for archiving artifacts or records of the town .It has been decided by the Town Board to offer the building for sale as a single family residence only and the lands around it are to be designated as a park. 200 Fairport Road is a grand house with a fine history and is awaiting another family to live in it and love it!